Clicking on and viewing the Properties gives you this information. Essentially, when someone requests “Sessions” in your DB, it routes them to “SessionState” in the tempdb. Change the DB Name at the top of the script to point to your current Sitecore Session DB. 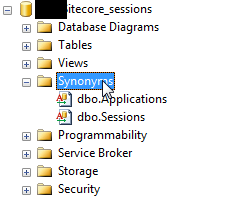 Ensure on the “SessionState” table, you name it “Sessions” because this is what Sitecore is going to be looking for. That should get everything back to using the Sitecore Sessions DB you created. I’ll update this post with more information when I hear back from Sitecore! It would be a lot cleaner if you didn’t have to run that in an EXEC statement, but switching DB context in a stored procedure is a huge security no-no. The SELECT permission was denied on the object ‘Application’, database ‘tempdb’, schema ‘dbo’. The INSERT permission was denied on the object ‘Application’, database ‘tempdb’, schema ‘dbo’. Did you encounter these? How did you resolve them? I’m going to put an edit in the post just for this, it’s not the best solution in the world, but it works. There may be a more elegant way. I granted SELECT, UPDATE, and INSERT permissions directly to the synonyms and that seems to have done the trick. I haven’t heard back from my engineer working with Sitecore for a couple weeks, so I’m assuming no news is good news…But this project has been delayed several times, so it might just have been delayed again. Oh, that is quite a bit more elegant. I’ll surely try this out. Thanks! Just a follow up. Setting permissions on the synonyms did not appear to work. I went with your solution. FYI, session states stored in tempDB will not survive a SQL Server Restart. Don’t know if that’s important in this case, it could be. Yeah. Agreed. If your SQL Server is restarting, chances are your users are going to have an issue anyway. Hopefully we’re not planning to restart SQL at peak site time, either. True point, though! Yeah, but at least after the restart the users can recover the sessions if they aren’t in tempDB. Did putting it in tempDB help with performance? I know tempDB puts its tables in memory, but only if prefixed with “#” (or was it “##”). If it’s a regular table, isn’t it still written to disk?